Kriss Kross puzzles are like a jigsaw with letters and you solve them by fitting words in the puzzle's word list into the correct positions in the diagrams. Words are listed in alpha order and by length and some diagrams have a word or two already placed to help you get started. This book contains solving information and full answers at the back. Kriss Kross puzzles are like a jigsaw with letters and you solve them by fitting words in the puzzle's word list into the correct positions in the diagrams. There are no clues as such, just words that will fit the spaces. Words are listed in alpha order and by length and some diagrams have a word or two already placed to help you get started. Puzzles are solved by thinking ahead, trying out different alternatives and finding the correct combination of words. This book contains solving information and full answers at the back in case you get stuck! 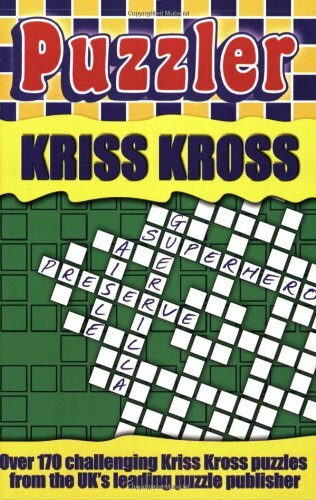 All of the Kriss Kross in this book are compiled by the UK's leading puzzle supplier, Puzzler Media, who sell more than half of all puzzle magazines sold in the UK.